A radiotelephone (or radiophone) is a communications system for transmission of speech over radio. 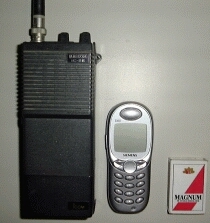 Radiotelephone systems are very rarely interconnected with the public switched telephone network, and in some radio services, including GMRS, such interconnection is prohibited. "Radiotelephony" means transmission of sound (audio) by radio, in contrast to radiotelegraphy (transmission of telegraph signals) or video transmission. Where a two-way radio system is arranged for speaking and listening at a mobile station, and where it can be interconnected to the public switched telephone system, the system can provide mobile telephone service. A standard landline telephone allows both users to talk and listen simultaneously; effectively there are two open communication channels between the two end-to-end users of the system. In a radiotelephone system, this form of working, known as full-duplex, require a radio system to simultaneously transmit and receive on two separate channels, which both wastes bandwidth and presents some technical challenges. It is, however, the most comfortable method of voice communication for users, and it is currently used in cell phones and was used in the former IMTS. The most common method of working for radiotelephones is half-duplex, operation, which allows one person to talk and the other to listen alternately. If a single channel is used, both ends take turns to transmit on it. Dual-frequency working splits the communication into two separate channels, but only one is used to transmit at a time. The user presses a special switch on the transmitter when they wish to talk—this is called the "press-to-talk" switch or PTT. It is usually fitted on the side of the microphone or other obvious position. Users may use a procedural code-word such as "over" to signal that they have finished transmitting. Radiotelephones may operate at any frequency where they are licensed to do so, though typically they are used in the various bands between 60 and 900 MHz (25 and 960 MHz in the United States). They may use simple modulation schemes such as AM or FM, or more complex techniques such as digital coding, spread spectrum, and so on. Licensing terms for a given band will usually specify the type of modulation to be used. For example, airband radiotelephones used for air to ground communication between pilots and controllers operates in the VHF band from 118.0 to 136.975 MHz, using amplitude modulation. Radiotelephone receivers are usually designed to a very high standard, and are usually of the double-conversion superhet design. Likewise, transmitters are carefully designed to avoid unwanted interference and feature power outputs from a few tens of milliwatts to perhaps 50 watts for a mobile unit, up to a couple of hundred watts for a base station. Multiple channels are often provided using a frequency synthesizer. Receivers usually feature a squelch circuit to cut off the audio output from the receiver when there is no transmission to listen to. This is in contrast to broadcast receivers, which often dispense with this. Often, on a small network system, there are many mobile units and one main base station. This would be typical for police or taxi services for example. To help direct messages to the correct recipients and avoid irrelevant traffic on the network's being a distraction to other units, a variety of means have been devised to create addressing systems. The crudest and oldest of these is called CTCSS, or Continuous Tone-Controlled Squelch System. This consists of superimposing a precise very low frequency tone on the audio signal. Only the receiver tuned to this specific tone is able to receive the signal: this receiver shuts off the audio when the tone is not present or is a different frequency. By assigning a unique frequency to each mobile, private channels can be imposed on a public network. However this is only a convenience feature—it does not guarantee privacy. A more commonly used system is called selective calling or Selcall. This also uses audio tones, but these are not restricted to sub-audio tones and are sent as a short burst in sequence. The receiver will be programmed to respond only to a unique set of tones in a precise sequence, and only then will it open the audio circuits for open-channel conversation with the base station. This system is much more versatile than CTCSS, as relatively few tones yield a far greater number of "addresses". In addition, special features (such as broadcast modes and emergency overrides) can be designed in, using special addresses set aside for the purpose. A mobile unit can also broadcast a Selcall sequence with its unique address to the base, so the user can know before the call is picked up which unit is calling. In practice many selcall systems also have automatic transponding built in, which allows the base station to "interrogate" a mobile even if the operator is not present. Such transponding systems usually have a status code that the user can set to indicate what they are doing. Features like this, while very simple, are one reason why they are very popular with organisations that need to manage a large number of remote mobile units. Selcall is widely used, though is becoming superseded by much more sophisticated digital systems. Mobile radio telephone systems such as Mobile Telephone Service and Improved Mobile Telephone Service allowed a mobile unit to have a telephone number allowing access from the general telephone network, although some systems required mobile operators to set up calls to mobile stations. Mobile radio telephone systems before the introduction of cellular telephone services suffered from few usable channels, heavy congestion, and very high operating costs. The Marine Radiotelephone Service or HF ship-to-shore operates on shortwave radio frequencies, using single-sideband modulation. The usual method is that a ship calls a shore station, and the shore station's marine operator connects the caller to the public switched telephone network. This service is retained for safety reasons, but in practice has been made obsolete by satellite telephones (particularly INMARSAT) and VoIP telephone and email via satellite internet. Short wave radio is used because it bounces between the ionosphere and the ground, giving a modest 1,000 watt transmitter (the standard power) a worldwide range. Most shore stations monitor several frequencies. The frequencies with the longest range are usually near 20 MHz, but the ionospheric weather (propagation) can dramatically change which frequencies work best. Single-sideband (SSB) is used because the short wave bands are crowded with many users, and SSB permits a single voice channel to use a narrower range of radio frequencies (bandwidth), about 3.5 kHz. In comparison, AM radio uses about 8 kHz, and narrowband (voice or communication-quality) FM uses 9 kHz. Marine radiotelephony first became common in the 1930s, and was used extensively for communications to ships and aircraft over water. In that time, most long-range aircraft had long-wire antennas that would be let out during a call, and reeled-in afterward. Marine radiotelephony originally used AM mode in the 2-3 MHz region before the transition to SSB and the adoption of various higher frequency bands in addition to the 2 MHz frequencies. One of the most important uses of marine radiotelephony has been to change ships' itineraries, and to perform other business at sea. In the United States, since the Communications Act of 1934 the Federal Communications Commission (FCC) has issued various commercial "radiotelephone operator" licenses and permits to qualified applicants. These allow them to install, service, and maintain voice-only radio transmitter systems for use on ships and aircraft. (Until deregulation in the 1990s they were also required for commercial domestic radio and television broadcast systems. Because of treaty obligations they are still required for engineers of international shortwave broadcast stations.) The certificate currently issued is the general radiotelephone operator license. ^ "47 CFR 95.141 - Interconnection prohibited". ^ "Guide to Radio Communications Standards for DEM Emergency Responders" (PDF). DEM. Rhode Island Department of Environmental Management. Retrieved 8 February 2018. Bruce, Robert V. Bell: Alexander Bell and the Conquest of Solitude. Ithaca, New York: Cornell University Press, 1990. ISBN 0-8014-9691-8. Carson, Mary Kay (2007). "8". Alexander Graham Bell: Giving Voice To The World. Sterling Biographies. New York: Sterling Publishing Co., Inc. pp. 76–78. ISBN 978-1-4027-3230-0. OCLC 182527281. The very first analog mobile radio telephone in Czechoslovakia (and in the whole Eastern Bloc) was AMR (sometimes AMRAD), in Czech language Automatizovaný městský radiotelefon (Automated Municipal Radiotelephone). The system was developed by company Tesla in Pardubice. Since 1978 it was tested in experimental mode and in 1983 it switched into full mode. At the time it was used mainly for communication between distant employees (typically in telecommunication industry). After 1989 commercial use was allowed and the network stayed until 1999 when it was stopped. The network was owned and operated by state telecom company "SPT Telecom" (later Český Telecom, then Telefónica O2 Czech Republic). Air-ground radiotelephone service includes commercial and general aviation services. Licensees may offer a wide range of telecommunications services to passengers and others on aircraft.The air-ground radiotelephone service operates on frequencies designated by the Federal Communications Commission. The Altai mobile telephone system is the pre-cellular 0G radiotelephone service that was first introduced in the Soviet Union in 1963, and became available in the most large cities by 1965. It is a fully automated UHF/VHF network that allows a mobile node to connect to a landline phones, and was originally conceived to serve government officials and emergency services, but has since spread into general use, and is still in use in some places, where its advantages outweigh those of conventional cellular networks. Work on the system of automatic duplex mobile communication started in 1958 in Voronezh Research Institute of Communications (VNIIS, now concern Sozvezdie). It was established subscriber stations and base stations for communicating with them. Autotel (also called PALM, or Public Automated Land Mobile) is a radiotelephone service which was the "missing link" between earlier MTS/IMTS and later cellular telephone services. It used digital signaling for supervisory messages (call setup, ringing, channel assignment, etc. ), except the voice channel was analog (as was the original NMT and AMPS cellular systems). This system was not cellular, as it used existent high-power (35 watt) VHF channels. This system was developed for rural British Columbia, Canada, where building a network of low-power cellular terminals to cover a forest would have been prohibitively expensive. The General Radiotelephone Operator License (GROL) is a license granted by the U.S. Federal Communications Commission (FCC). The GROL does not convey the authority to operate an amateur radio station, for which the FCC has a separate licensing system, nor is it required for any engineering jobs in radio and television broadcasting. However, some services such as aviation, marine and international fixed public stations still require repair and maintenance to be performed by a person holding a GROL.An FCC GROL is required to adjust, maintain, or internally repair FCC licensed radiotelephone transmitters in the aviation, maritime, and international fixed public radio services. It conveys all of the operating authority of the Marine Radio Operator Permit (MP). It is also required to operate the following: any compulsorily equipped ship radiotelephone station operating with more than 1500 watts of peak envelope power, a voluntarily equipped ship or an aeronautical (including aircraft) stations with more than 1000 watts of peak envelope power. The GROL conveys all of the operating authority of the Marine Radio Operator Permit (MROP). A MROP is required to operate radiotelephone stations aboard vessels of more than 300 gross tons, vessels that carry more than six passengers for hire in the open sea or any coastal/tidewater area of the United States, certain vessels that sail the Great Lakes, and to operate certain aviation radiotelephone stations and certain coast radiotelephone stations. GROL does not confer licensing authority to operate or maintain GMDSS or radiotelegraph (Morse code) commercial stations. Because of the wide range of positions it covers, the GROL is the most popular FCC commercial license, accounting for about 80% of those issued by the Commission. Like all FCC commercial licenses, the GROL is issued for the lifetime of the licensee. An endorsement that can be added to the GROL (as well as to both the GMDSS Maintainer and Radiotelegraph licenses) is "Ship Radar Endorsement." This allows the holder to install, service, and maintain Radar systems on board vessels.In the past, the FCC issued the GROL in yellow 8.5 x 11 inch "diploma-like" form. It is now issued in both a 5 x 7 certificate and a wallet-sized form. As with other licenses that it issues, the FCC allows those who pass the tests to print additional copies from its website. Marine VHF radio refers to the radio frequency range between 156 and 174 MHz, inclusive. The "VHF" signifies the very high frequency of the range. In the official language of the International Telecommunication Union the band is called the VHF maritime mobile band. In some countries additional channels are used, such as the L and F channels for leisure and fishing vessels in the Nordic countries (at 155.5–155.825 MHz). Marine VHF radio equipment is installed on all large ships and most seagoing small craft. It is also used, with slightly different regulation, on rivers and lakes. It is used for a wide variety of purposes, including summoning rescue services and communicating with harbours, locks, bridges and marinas. A marine VHF set is a combined transmitter and receiver and only operates on standard, international frequencies known as channels. Channel 16 (156.8 MHz) is the international calling and distress channel. Transmission power ranges between 1 and 25 watts, giving a maximum range of up to about 60 nautical miles (111 km) between aerials mounted on tall ships and hills, and 5 nautical miles (9 km; 6 mi) between aerials mounted on small boats at sea level. Frequency modulation (FM) is used, with vertical polarization, meaning that antennas have to be vertical in order to have good reception. Modern-day marine VHF radios offer not only basic transmit and receive capabilities. Permanently mounted marine VHF radios on seagoing vessels are required to have certification of some level of "Digital Selective Calling" (DSC) capability, to allow a distress signal to be sent with a single button press. Marine VHF mostly uses "half-duplex" transmission, where communication is over a single radio frequency, and only one of the parties can transmit at a time. The transceiver is normally in receive mode; to transmit the user presses a "push to talk" button on the set or microphone which turns the transmitter on and the receiver off. Some channels, however, are "full duplex" transmission channels where communication can take place in both directions simultaneously when the equipment on both ends allow it. Each full-duplex channel has two frequency assignments. Duplex channels can be used to place calls over the public telephone network for a fee via a marine operator. When full-duplex is used, the call is similar to one using a mobile phone or landline. When half-duplex is used, voice is only carried one way at a time and the party on the boat must press the transmit button only when speaking. This facility is still available in some areas, though its use has largely died out with the advent of mobile and satellite phones. Marine VHF radios can also receive weather radio broadcasts, where they are available. The Mobile Telephone Service (MTS) was a pre-cellular VHF radio system that linked to the Public Switched Telephone Network (PSTN). MTS was the radiotelephone equivalent of land dial phone service. The Mobile Telephone Service was one of the earliest mobile telephone standards. It was operator assisted in both directions, meaning that if one were called from a land line the call would be routed to a mobile operator, who would route it to one's phone. Similarly, to make an outbound call one had to go through the mobile operator, who would ask for the mobile number and the number to be called, and would then place the call. This service originated with the Bell System, and was first used in St. Louis on June 17, 1946. The original equipment weighed 80 pounds (36 kg), and there were initially only 3 channels for all the users in the metropolitan area, later more licenses were added bringing the total to 32 channels across 3 bands (See IMTS frequencies). This service was used at least into the 1980s in large portions of North America. On October 2, 1946, Motorola communications equipment carried the first calls on Illinois Bell Telephone Company's new car radiotelephone service in Chicago. Due to the small number of radio frequencies available, the service quickly reached capacity. MTS was replaced by Improved Mobile Telephone Service (IMTS), introduced in 1964. Mobile radio telephone systems were telephone systems of wireless type that preceded the modern cellular mobile form of telephony technology. Since they were the predecessors of the first generation of cellular telephones, these systems are sometimes retroactively referred to as pre-cellular (or sometimes zero generation, that is, 0G) systems. Technologies used in pre-cellular systems included the Push to Talk (PTT or manual), Mobile Telephone Service (MTS), Improved Mobile Telephone Service (IMTS), and Advanced Mobile Telephone System (AMTS) systems. These early mobile telephone systems can be distinguished from earlier closed radiotelephone systems in that they were available as a commercial service that was part of the public switched telephone network, with their own telephone numbers, rather than part of a closed network such as a police radio or taxi dispatch system. These mobile telephones were usually mounted in cars or trucks (thus called car phones), although briefcase models were also made. Typically, the transceiver (transmitter-receiver) was mounted in the vehicle trunk and attached to the "head" (dial, display, and handset) mounted near the driver seat. They were sold through WCCs (Wireline Common Carriers, a.k.a. telephone companies), RCCs (Radio Common Carriers), and two-way radio dealers. Rural Radiotelephone Service (RRTS) provides basic, analog communications service between locations deemed so remote that traditional wireline service or service by other means is not feasible. RRTS uses channelized radio to provide radiotelephone services such as Basic Exchange Telephone Radio Service between a fixed subscriber location and a remote central office, private line service between a two fixed locations or interconnection between two or more central offices. RRTS does not enable mobile communications. SFR (Société française du radiotéléphone) is a French telecommunications company that provides voice, video, data, and Internet telecommunications and professional services to consumers and businesses. SFR is owned by Altice Europe. As of December 2015, it has 21.9 million customers in Metropolitan France for mobile services, and provides 6.35 million households with high-speed internet access.SFR also offers services in the Overseas Departments of France : in the Caribbean islands of Martinique, Guadeloupe, and in Guyane as well as in the Indian Ocean, in Mayotte and on the Réunion island through SRR (Société Réunionnaise du Radiotéléphone) although the company is branded as SFR Réunion. SFR (SFR Belux) operated in Belgium as a cable operator and MVNO in some communes of Brussels Region and in some areas of Luxembourg. The division was sold to rival Telenet (owned by Liberty Global) in December 2016. Calls from Dominica to the US, Canada, and other NANP Caribbean nations, are dialed as 1 + NANP area code + 7-digit number. Calls from Dominica to non-NANP countries are dialed as 011 + country code + phone number with local area code. Telecommunications in Laos are based on a network of telephone lines and radiotelephone communications in remote areas, as well as mobile phone infrastructure. The system is not well-developed. In large part thanks to international aid programs, Moroni has international telecommunications service. Telephone service, however, is largely limited to the islands' few towns.